Distributed By – Astor Records Pty. Ltd. Manufactured For – Astor Records Pty. 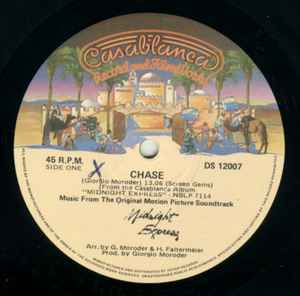 Ltd.
From the Casablance Album "MIDNIGHT EXPRESS" - NBLP 7114. Music From The Original Motion Picture Soundtrack "Midnight Express". Released in a generic ASTOR DISCO SINGLE sleeve. Manufactured and Duistributed By Astor Records.